A few months ago I entered to win one of those seemingly cool World of Warcraft statues made by a company called Figure Prints. Apparently the process involved in creating these figures takes quite a bit of time, so the company chooses its customers via a lottery system. They are unable to churn enough of these out each month to meet the demand, so you register at their site and then every month your e-mail address is thrown into a hat. If you are lucky enough to win the lottery for character creation, it costs a hundred bucks and you have a few weeks to decide on which toon you want to bring to life. In my case, I was selected within two months of entering, which I guess is pretty lucky since my wife has been entered for at least eight months and has yet to be chosen. Immediately I jumped at the chance to have my very own personalized WoW action figure. When I received the e-mail notifying me that I’d won, I was pretty stoked to say the least. Having a personalized World of Warcraft souvenir like that is pretty cool, right..? Anyway, I went ahead and settled on the character to cast which was Garwulf of course. Next, you go through a design wizard where you select the character’s pose and the type of base that it’s mounted on. You also have to make sure that your armory profile reflects the gear you want displayed on your character, then you submit your order. After a few months this piece of $hit statue showed up on my doorstep. It had been so long since I ordered it I had sort of forgotten about it. Once I realized what it was, I gleefully opened the package only to find that Garwulf had been owned by UPS. It’s not really their fault though. The careless packing of these delicate statues is really to blame. Lucky for me the statue was broken, because it made seeking a refund quite easy. Had it not been broken I probably would have still pursued a refund just due to the lack of quality. These things are pretty weak. The colors are very washed out and the figures lack texture. The examples shown on their website were no strangers to PhotoShop that’s for sure. Figure Prints were actually really cool about issuing me a refund. They also invited me to have another one created at a later date if I so desired. I doubt that I’ll ever decide to get another one made unless they really improve upon the manufacturing process. I understand that the technology used to create them isn’t cheap and that $100 is a small price to pay, but I’d rather pay twice as much for something that I’d at least want to display in my home or office. I’d recommend staying away from these things. It’s really a neat concept, but it’s a long ways away from being perfected. … Is now on this site. I created a page devoted to the macros that I use. Check it out. For nearly two years I played World of Warcraft with absolutely no addons. I was a purist you might say. Once I began raiding however, my guild required me to have a threat meter and boss encounter alerts. Since I then had to install those essential 3rd party addons, I decided to see what else was out there. To make a long story short, after about a year of trying various addons, I’ve assembled a suite of mods that I believe to demonstrate awesomeness at its finest. My UI is geared primarily towards PvP, but works equally as well for parties and raids. The emphasis is on organization and useful information during combat. 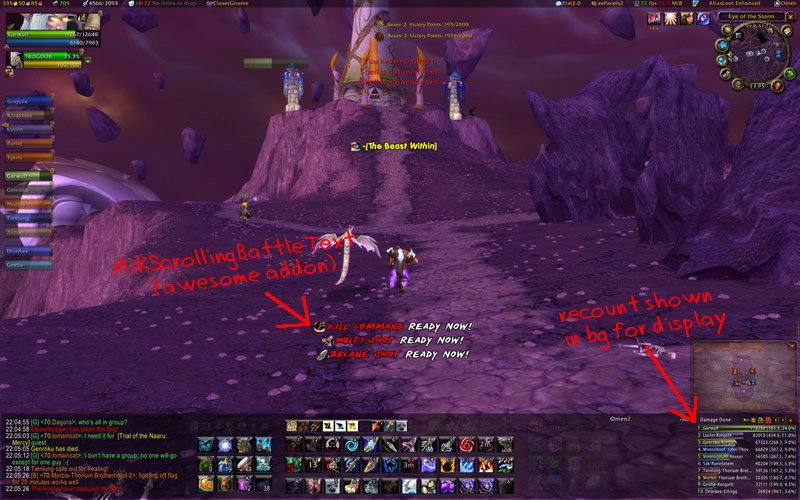 Since I played for the better part of two years without addons, I got pretty used to the default Blizzard UI. This is why I’ve chosen to keep the unit frames and mini map in their usual spots. I tried different configurations, but I prefer having those items at the top of the screen. A lot of people like to have their unit frames at the bottom either near their character or action bars, but I say go with whatever works. SimpleMiniMap – Customize the mini map placement, size, etc. 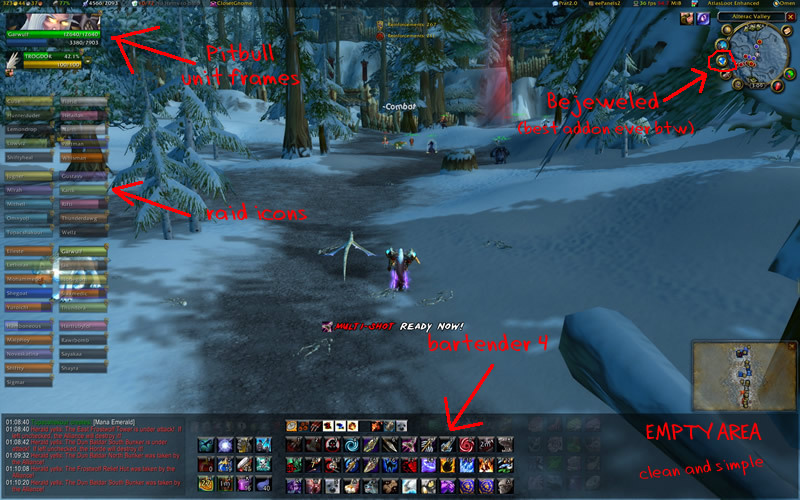 Those are the addons that are responsible for the appearance of my UI. Just like anything else, these addons require a little work in order to tailor them to your needs. In my opinion though, it’s worth it to spend a little bit of time on something that will enhance your enjoyment of the game. I don’t consider myself reliant upon addons, but I’d prefer not to go without after having gotten used to them. Other than those mentioned, I use a few FuBar plugins that make life easier. These are things like auto repair, inventory management, fps and latency meter, clock, etc. After Wrath of the Lich King is live and provided my UI isn’t completely broken, I’ll post a detailed and itemized list of my current addons. If people are interested, I may even upload a zip file for others to download and install. Enough blogging… time to go play!